American Security Products (AMSEC) is one of the world's best-known providers of security safes and security solutions. 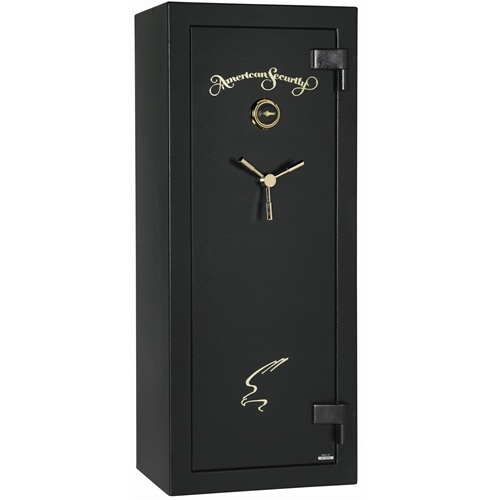 The Amsec TF5924 Gun Safe is one of the reasons for this reputation whether you need a safe to store your guns, cash, or other valuables this safe has you covered! 3/16" Steel Plate door with 3 layers of fire insulating material. Mercury Class I fire protection of 1200°F for 30 minutes. Designed to maintain an interior temperature of less than 350°F. 2 Stage Dual fire seals with silicone seal on door jamb and expandable Palusol™ seal on door. Body constructed of 14-gauge solid steel plate. 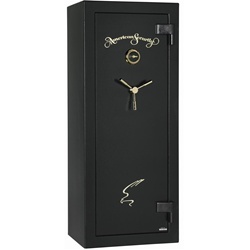 Group II, key-changeable lock with chrome spy-proof dial, internal relocker and drill resistant hardplate.. Optional electronic lock available. 3-point chrome tri-spoke handle. Bold zinc die-cast polished chrome logo. 4-way boltwork with 14 massive 1¼" bolts. Adjustable ball bearing hinges. Textured Black exterior and Mocha fabric interior including back-cover and firewalls. 4 pre-cut anchor holes with mounting hardware and 1 pre-cut electrical access hole.